The Second World War fundamentally changed the societies of Central and Eastern Europe. Social bonds and structures were destroyed by brutal occupation policies and extensive deportations. These had long-term consequences for the societies as a whole, but also for individuals within the social fabric of their lives. Not least of all, gender roles and gender relations were influenced by it. 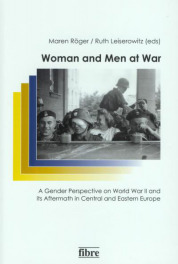 This everyday and gender historical dimension of the Second World War in Central and Eastern Europe has often come up short in the research whereby an integrated view of the effects in the post-war period was obscured. This volume represents a collection of contributions about different countries in this region. This was an area scarred by having been overpowered and seized multiple times and by the brutal occupations of German and Soviet aggressors. And then there were the inner-societal tensions and conflicts that followed, discharging themselves along ideological and ethnic lines. The central questions are (1) about the ideological promptings and the everyday transformation of gender roles in the occupation and defense armies as well as in the partisan groups; (2) about the power of gendered interpretive models in official propaganda and the individual self-understanding of those who were occupiers and those being occupied; and (3) the corresponding effects of the war on the post-war period. Gender-specific bodily experiences also play an important role.